I hope you’re enjoying a long weekend! I was so excited to have 3 days to sleep in and would you believe that I’ve been up before 6 all three days? My allergies may actually kill me. I got real spoiled living in Colorado with no trees or grass (my allergens) and now that I’m surrounded by green stuff ALL THE TIME, I’m losing my mind. Seriously allergies, can I just sleep? The good news is, I managed to watch most of The Jinx in total silence yesterday morning. And I’m obsessed. I think I may watch it again. Definitely better than Making a Murderer. So Valentine’s Day is coming up real fast. And that’s terrifying to me because I haven’t even been to Target once to check out all the pink heart stuff that I no doubt need in my life. Odds are, my husband will be gone for Valentine’s Day so I definitely plan on making myself something rich and decadent and probably filled with chocolate. 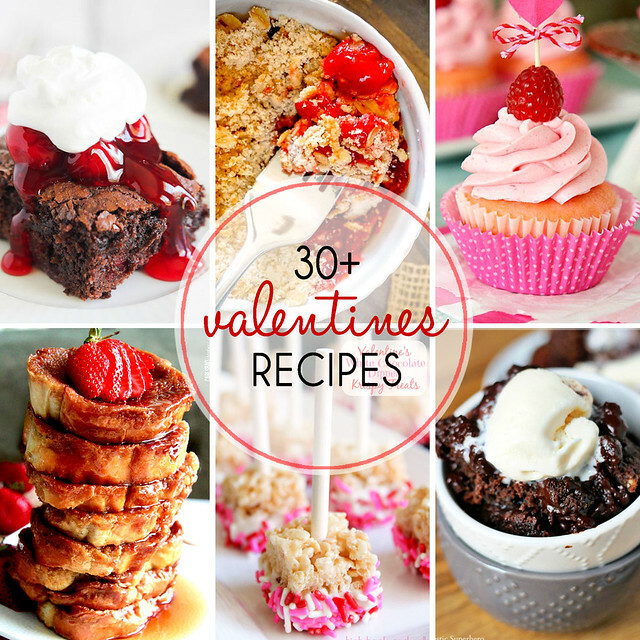 And I’m sure I’ll find it on this delicious list of Valentine’s Day recipes! This list has something for everyone and can’t get enough of all the cute desserts! I hope you find something delicious to make for your sweetie!